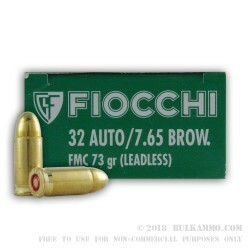 A lot of firearms are still in existence that shoot the Eponymous 7.65 Browning (.32 Auto in North America); this is Fiocchi’s FMJ version of this round and it functions well in all of the older guns that are chambered for the round. This is a great defensive option from many decades ago and there are quite a few guns chambered for the round, which was a wonderfully shooting load that had mild recoil but decent ballistics and was for a time a very effective choice for self-defense and even for duty weapons. This load is a modern cartridge that utilizes the classic loadout configuration to keep the rounds safe for use in the older guns that are chambered for it. The 73 grain full metal jacket projectile is accurate, feeds well and the cartridge is well built, allowing for excellent reliability and versatility. While it is a classic loadout, it offers a modern twist in the “leadless format” to make sure it is compatible with a wider range of firearms and is actually ahead of the curve on the pending regulatory changes regarding lead and heavy metals in shooting environments. This is a very well-appointed round by Fiocchi and there are a lot of little details that show the excellent value of the load, including the primer sealant and the leadless design. Given the low price point for the 1000 round case lot, this is an exceptional option.